In a categoric signal to Washington and political opponents at home, Prime Minister Manmohan Singh today said that there would be “no compromise” on the Indo-US nuclear deal, days ahead of the US Congress vote on the civilian nuclear energy cooperation. Seventh anniversary of ‘Op Vijay Divas’ to commemorate the Kargil war of 1999 was observed with military fervour at Dras War Memorial in Kargil district of the Ladakh region today. 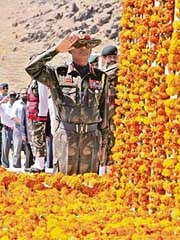 Lt Gen Deepak Kapoor, GOC-in-C, Northern Command, laid wreaths at Dras War Memorial at the base of the Tololing features. The House of Representatives was expected to approve a US-India nuclear cooperation agreement following a debate scheduled for late Wednesday afternoon, according to congressional sources. In the first incident of its type in the 17 years’ history of terrorism in Jammu and Kashmir, three Army jawans have been arrested in the border district of Poonch on the charges of operating as over ground workers (OWGs) of the Lashkar-e-Toiba (LeT) outfit. Industrial units owned by relatives of the Parliamentary Secretary from Batala Ashwani Sekri have got refunded fraudulently sales tax worth Rs 1 crore from the Taxation Department. This has been reported by the Assistant Excise and Taxation Commissioner Gurdaspur, Tajinder Singh Virk to higher authorities of the department. Ten personnel of the Haryana Armed Police (HAP) were killed when their bus collided head-on with a truck on the Narnaul-Singhana road, near Raghunath Pura in Mahendergarh district, today. Sharing the concern of members in the Lok Sabha, the government today unequivocally condemned the Israeli action in Lebanon and the “disproportionate and excessive use of force against human lives and institutions. The Supreme Court today reserved its judgment on a petition seeking cancellation of the bail of Railway Minister Lalu Prasad Yadav in the fodder scam and disproportionate assets (DA) cases on ground of his alleged interference in the judicial process after the UPA government came to power. Farmers from Punjab, Haryana and other northern states today staged a protest near Parliament under the banner of the BKU demanding the waiving of loans of farmers in distress conditions, increase in the MSP and bringing down the interest rate on crop loans to 4 per cent.